The ODMP Blog: Attention Patch Collectors: We Need Your Help! 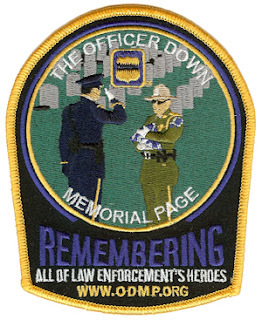 The ODMP is the most comprehensive memorial for law enforcement officers, preserving the stories of their lives and the history of the agencies they served. A total of 6,117 different agencies have suffered at least one line of duty death. Displaying a patch on an officer's memorial not only honors the fallen officer, but is also an honor to all other members of that department. Over the past few years we've been fortunate enough to have received patches or suitable images to display alongside almost every single officer. Unfortunately, however, we're still missing patches from 126 agencies. Most of these agencies are small, rural agencies or no longer exist. We need your help to fill in the gaps. I'm asking all police patch collectors to check their collections for the patches we need. If you have one, I ask that you send us a high-resolution scanned image so it can be added to the proper memorial. If you have knowledge that any agency included on the list never wore a patch, and the agency no longer exists, please email us with details at [email protected]. Thank you in advance for your assistance. Together, we can ensure every officer is remembered. @driscoll1980 - Updated patches can be sent to the same address, but unfortunately we will not be able to provide free patches for updates - only for patches we are currently missing.